“SMITE offers a new take on MOBA style games with its third person view and WASD controls, breathing life into a slightly stale game genre plagued with copy cats.” Read our full review for more! Most Multiplayer Online Battle Arena games (known simply as MOBAs) follow the same basic formula, with the same top down view of the battle field that we either love or curse vehemently. It certainly has strategical advantages, but what of the many players who would prefer a more third person, MMO PVP style version of these beloved games? Until recently I would have told you that it didn’t exist. Most MOBAs like League of Legends and DOTA all offer the same eagle eye style view of the map, but that’s just the way the genre is…right? As it turns out, it doesn’t have to be. A new game from Hi-Rez Studios, aptly named SMITE, has turned that way of thinking on its head. 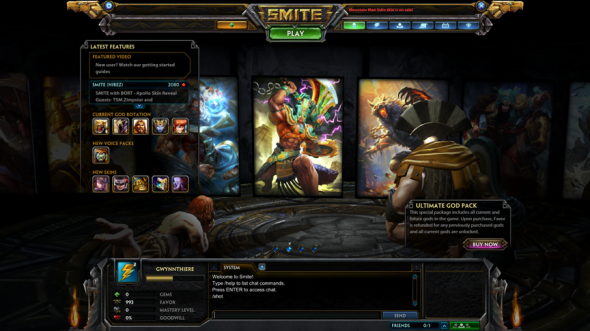 Released on March 25th, 2014, SMITE is still gaining steam. Players assume the roles of gods, demi-gods and immortals from real-life mythologies that span many different cultures from the much expected Greek and Roman gods, to Mayan, Norse or Hindu gods. 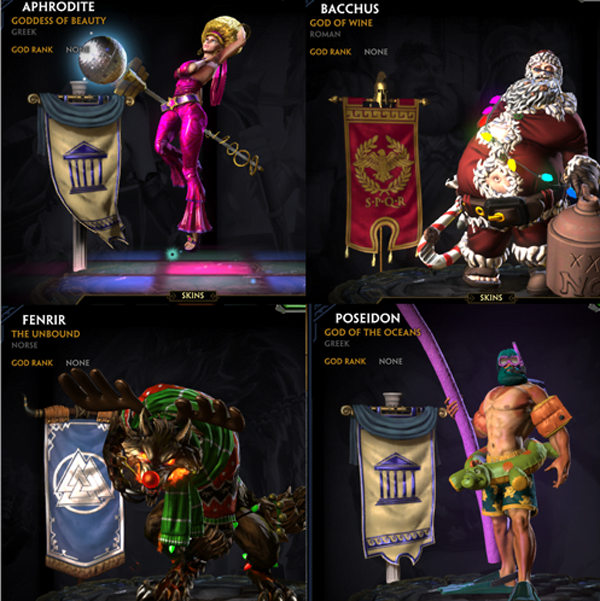 SMITE offers much the same battle modes as we’ve come to expect from high ranking MOBA games. In Conquest (5v5) or Joust (3v3) mode you’ll find yourself in the usual fight of destroying your enemy’s towers before they can destroy yours. The change in camera view and controls brings a freshness to a game genre that has long been threatening to go stale and opens up a world of possibilities. For example, SMITE doesn’t use the typical click to move mechanic that those familiar with the genre have gotten used to. By changing the movement to WASD, SMITE seems to bridge the gap between MMO players and MOBA players rather nicely. Controlling just your chosen god, and not being able to see the whole battlefield, lends the combat a more organic feel and those who play player vs player in their favorite MMO will find it very comfortable. If tower capture isn’t your favorite flavor, there are plenty of other options to choose from. Arena offers you an open coliseum type arena to fight in, without any lanes or tower objectives. It’s just a pure, unfiltered bloodbath, occasionally with a siege tower to add a bit of spice. Assault offers what I would call a “hard-mode” conquest game. You’re given all random gods to play, there’s only one lane and none of the fun neutral monsters to take out. You can only return to your base if you die, you can’t keep running back to heal, and it’s just a constant hard punch to the other team’s base. From practice mode, to co-op, normal and custom games, SMITE offers a huge selection to choose from depending on your mood. Personally, the biggest draw for me has been the fact that you can not only play as gods, but you can learn about their mythology and history within the game. By clicking on the lightning bolt in the upper bar you can flip through all available gods, even the ones you haven’t purchased or unlocked yet, and learn about their mythos, or see an overview of them and what items are recommended for that god. The overview is particularly helpful for figuring out what kind of god you’d like to pick up. A lot of truly helpful information, I think. Of course, what would an MOBA be without the ability to customize your character to some degree? 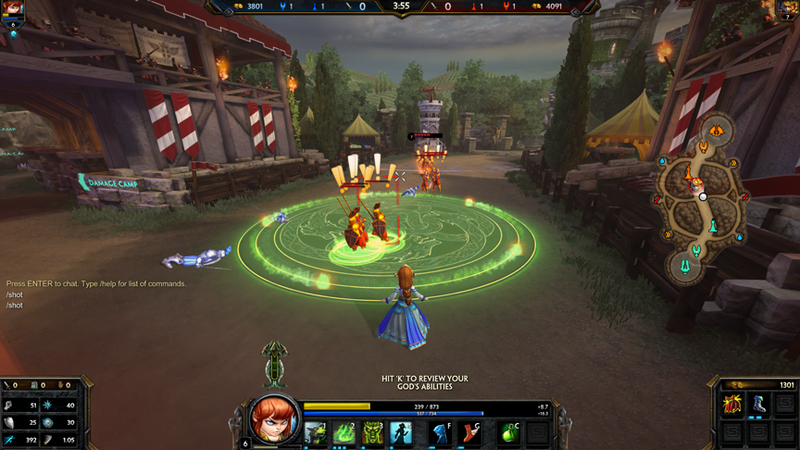 In this area, SMITE does not always take itself as seriously as one might expect for a game about Gods and Immortals that are still worshiped today. There are skins that change the color, like one would expect, but then there are things like “Afro-dite”, “Father Chrishmash”, “Wreck the Halls” and my personal favorite “Pool-seidon”. Why yes, they are as irreverent and amusing as you might think. While SMITE does suffer from many of the same problems that plague other MOBA games, like rage-quitting and people who AFK when they enter a battle, the game itself is an enjoyable diversion from the usual. In fact, when in a co-op game and someone quits before the end, the system will boot one of the AI Gods in an effort to keep the game fair. An act that is, at least by me, much appreciated. 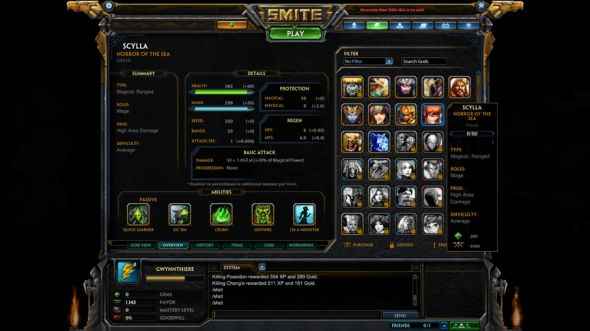 So if you like MOBAs, or are just looking to get into them, SMITE is a great game you should certainly check out. It’s free to play with an in-game store for micro-transactions and you can download a copy over at Hi-Rez Studios’ Website. Seriously, I can’t get over Fenrir in inflatable reindeer antlers. I just…can’t. SMITE offers a new take on MOBA style games with its third person view and WASD controls, breathing life into a slightly stale game genre plagued with copy cats. Combined with the fact that it's free to play and the lure of playing as your favorite mythological god/demi-god/immortal, it's certainly worth a download.